Drivezy raised $20 Million in series B funding round. 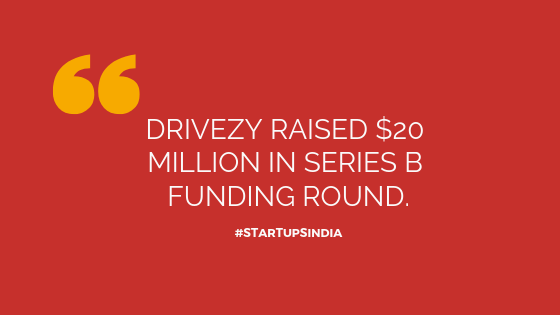 Car rental startup Drivezy raised $20 million (INR 140 Cr) in the Series B funding. The funding is led by Japan’s Das Capital which is the existing investor of the company and another new investor Yamaha Motor Co. The new fund utilized for expanding its operations for the new markets in the country and for developing of their integrated services which help the Drivezy to serve better to the clients. The startup is based out in Banglore which started in the year 2015, by Ashwarya Pratap Singh, Hemant Kumar Sah, Vasant Verma, and Amit Sahu. It is previously known as Just Ride. It is a self-driven car rental service provided for p2p. It has partnered with 2000 owners, and it’s having more than 7000 operational cars which are running. The car rental startup upto now raised $31 million equity fund, remaining $10 million from IT-Farm, CrowdWorks, Axan Ventures, and Das Capital. Apart from it raised $100 million under asset financing. The raised fund utilized for the next three years from now and used to run a special purpose vehicle. The startup is planning to expand its vehicles in its marketplaces Hyderabad and Bangalore. By the end of the year, we are going to add 10,000 bikes. Read complete startup story of drivezy. Reliance Industries Limited invested INR 1.3Cr in Media startup NewJ.